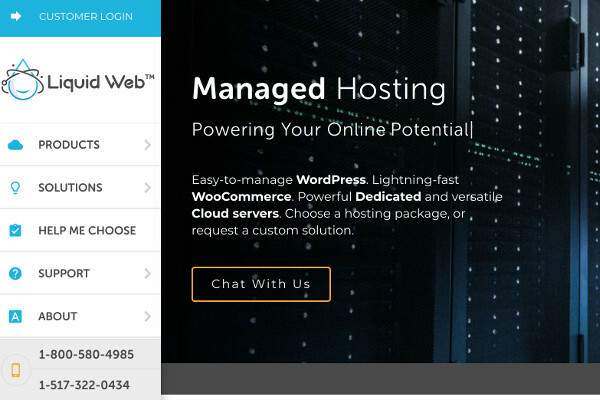 Best Dedicated Hosting | Which Plan Can Handle Your Website Traffic? If you are looking for the best dedicated hosting companies, then look no further. We review each host's dedicated plans and pricing before touching on one advantage and drawback related to their service. After comparing the best hosts on the market, we want you to make the best decision; we have therefore included a buyers guide at the end of this article. This guide gives clarity on some of the more technical aspects and components of servers. We include key insights so that you are able to discern between offerings and find the best plan for your website. This table ranks the best dedicated hosting providers whilst showing a few of the features and their entry-level pricing. 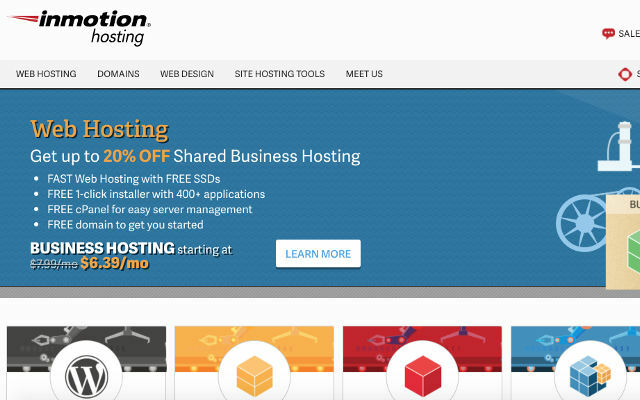 InMotion is our #1 Choice for Dedicated hosting. As one of the most senior hosting companies in the market, InMotion Hosting is no stranger to great features at affordable prices. With their mature infrastructure and extensive experience, you can expect great service. InMotion Hosting offer six dedicated hosting plans, the Essential, Advanced, Elite, CC-500, CC-1000 and CC-2000 plans. Notable differences in these plans can be seen in the performance aspects. Pricing begins at $105,69 per month for the Essential plan and go all the way up to $519,49 per month for the CC-2000 plan. Price could be seen as a drawback. The Essential plan, which is InMotion’s entry-level dedicated plan is priced significantly higher than their competitors, however, the value packed into each plan is well worth the price. One positive is that each plan includes free SSD. When compared to traditional HDD; read/write speeds are dramatically increased because information is stored in microchips as opposed to a moving mechanical arm which reads information in the correct location on a storage platter. InMotion Hosting has received an A+ performance rating by the Better Business Performance Bureau who’s primary function is customer protection. The Bureau evaluates American and Canadian based businesses and evaluates their integrity and performance. InMotion Hosting provide dedicated hosting plans which are ahead of their competitors. Not only are the essentials included, but key add-on features that will ensure your experience is top class. Hostwinds is a relatively new hosting company which offers very modern and impressive hardware. Hostwinds is currently the only CPV Lab-approved hosting provider which favors agencies, advertisers, merchants and affiliate marketers by optimizing their plans towards tracking. Hostwinds has nine dedicated plans available depending on your hosting needs. Pricing starts from as little as $106 per month for their cheapest plan, the E3- 1270. As mentioned before, there are a range of plans on offer and prices go all the up to $364 per month for their most premium plan, the 2 x E5- 2670 V2. A great buying feature is the ability to customize your package and include any extras. You will be able to adjust your plan in terms of Operating system, hard drive, RAM, IP addresses and outbound bandwidth. One reservation relating to Hostwinds would be experience. Being a relatively new hosting company in an industry dominated by many mature providers, some may feel some unease allowing Hostwinds to manage such a critical task, especially at this scale. Hostwinds is sometimes best known for their plans designed specifically for Minecraft players, however it is important to note that they provide solid speed, reliability and performance, not to mention an excellent support system and a 60-day money back guarantee. 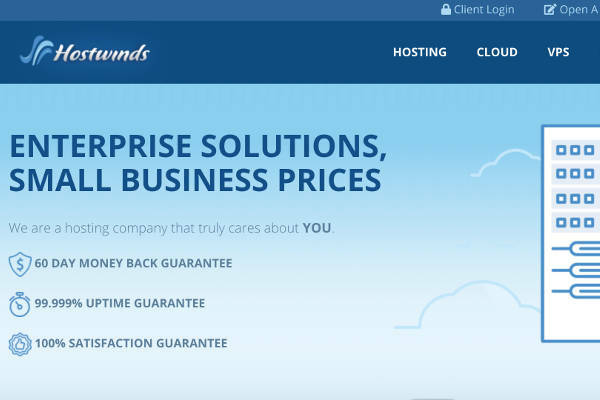 Hostwinds is a fresh face in the hosting world, and although they are still in the process of building their long term reputation, their impressive hardware and great pricing has brought them to the forefront of their industry. Hostwinds boast some of the most impressive hardware in the industry. They have a variety of options, but one thing that each plan has in common if performance. If you are in the market for a high performance host, then Hostwinds is just that. 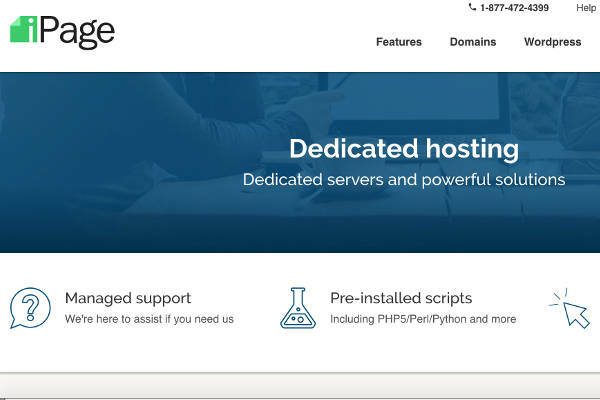 iPage hosting is best known for their pricing on shared hosting plans and reliable customer support, however, they offer great value in their dedicated plans too. You can expect similar value to the dedicated plans offered by BlueHost in terms of features, after all they are owned by the same company. iPage has three dedicated hosting plans available, the Startup, Professional and the Enterprise plans. You will find these plans to be very competitively priced with the Startup plan coming in at $119.99 per month, the Professional at $151.99 per month and the Enterprise at $191.99 per month. A drawback can be experienced when considering their long term pricing. In order to enjoy the listed price on their site, you will be expected to commit to a 3 year plan. The renewal pricing is standard in terms of their competitors, however there are several competitors who do offer a better deal. A great positive is related to iPage’s customer support. They offer 24/7 support across all their channels being the telephone, chat, email and a ticketing system. Their support lines are also simple and easy to use making for a pleasant experience when issues do arise. iPage provide affordable plans so that small businesses can take their ideas online. They make the process quick and easy with most features available on their platform. 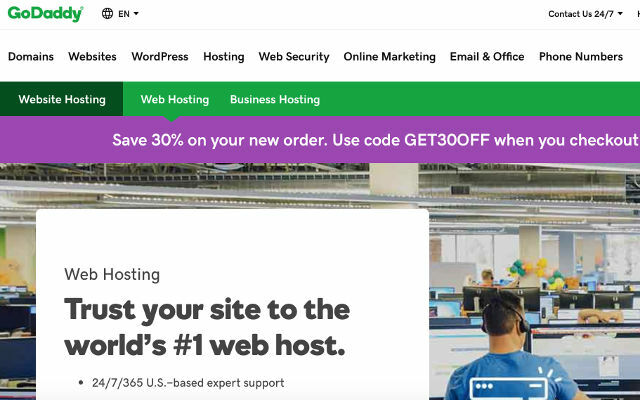 With 20 years of experience hosting websites for non-profit, personal, business and social purposes, they are sure to meet your hosting expectations. If you are looking for a host that understands exactly what small businesses need, then iPage is for you. Their packages cater directly to the needs of SME's which allow you to take your ideas online at a price that is affordable. Liquid Web hosting is best known for their managed services and feature-filled plans. You can expect dedicated plans packed with value and even though they offer very strong managed services, their pricing is still competitive. Liquid Web offers four single processor plans and three dual processor plans totalling seven dedicated server plans. The cost of the single processor plans start at $199.99 per month and go up to $389.99 per month. The dual processor plans begin at $399 per month and go up to $599 per month. The core difference in these plans is performance. These plans are excellent for high traffic websites or applications, they will service file server hosting and reseller hosting really well too. Something to be improved could be their pricing. Liquid Webs cheapest dedicated package begins at $199.99, where most of their competitors offer a starting package between $100-$120 per month. This significant cost difference can however be explained when looking at the performance on offer. One competitive advantage of Liquid Web is their customer support. Response times for telephone and live chat support is reported to be within two minutes. You can expect to be helped within 30 minutes through their ticketing service. Liquid web has been in operation for over twenty years and currently have over 500k sites under management. They were also voted as the #1 web host for dedicated server hosting by HostingAdvice.com which speaks to the quality of their service. You won't find any kinks in the dedicated plans of Liquid Web hosting. Each plan is performance driven, coupled with features to match. If you are in the market for performance and features, then Liquid Web hosting is for you. From inception BlueHost has been committed to offering reliable, secure and flexible dedicated hosting plans. This reliability can further be seen by their in-house approach to server maintenance and construction. As with their VPS and shared hosting, Bluehost offer three dedicated hosting plans, the Standard, Enhanced and Premium plan. Similarly to their Shared and VPS offerings, the difference between these plans can be found in their technical features. Pricing for these plans are as follows: the Standard plan at $79.99 per month, Enhanced at $99.99 per month and the Premium plan at $119.99 per month. There are really only two things to whinge about relating to Bluehost’s dedicated server hosting. Firstly, no SSL certificates are included in any of their three plans, but can be purchased at a discounted price from BlueHost. Secondly, no sites are migrated for free; the cost thereof is $149.99. A positive is that servers are built and maintained in-house. Because of this, their engineering team have a wealth of technical knowledge related to simple and complex server issues. The result is quick and seamless solutions to any problems which may arise. 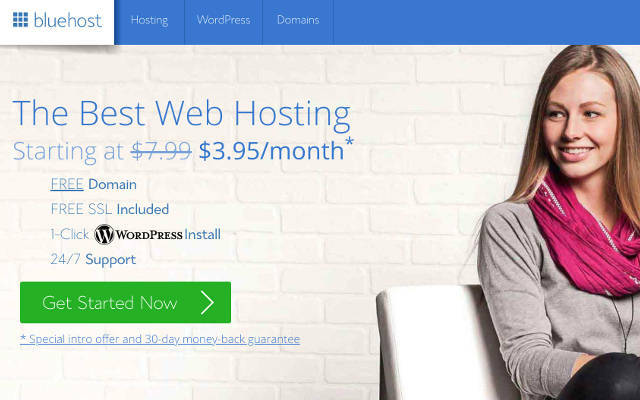 Since being founded in 2003, BlueHost has been at the forefront of hosting and remains one of the largest hosting providers in the world; the most notable accolade being one of only three hosting companies to be officially recommended by WordPress. BlueHost offers the best priced dedicated hosting on the market. If you are in need of dedicated resources coupled with an unbeatable price, then BlueHost is for you. Dedicated hosting is the most secure and reliable way to host a website. This buyers guide covers the key considerations before choosing the best host for your website. We provide some clarity relating to hardware and management so that site owners know what to look for when renting their dedicated server. The data centre and network, bandwidth, hardware, security, management and the impact of downtime will be covered. Data centres play a central role in any sort of hosting service. The data centre is critical in the reliability of your server as this is the physical location where all your files and data are stored. The geographic location of the data centre is also of importance. The shorter the distance between a user and a data centre, the quicker the server will be able to render the files requested and the quicker your site files appear on the users screen. It is recommended to ensure that the hosting service you subscribe to has data centres close to the geographic locations of your potential users as this will ensure the best performance. For example, it will not be the best idea to have your server in a data centre in Australia, but most of your website users are Americans. So be sure to be aware of this location factor as it does affect the network quality. Bandwidth requirements will depend on the expected traffic of your website. If you do not have regular site traffic and your site experiences spikes which vary in size, then the best option would be to find a hosting option which gives unmetered bandwidth or a very large amount of bandwidth. This choice will help to stabilize your costs somewhat whilst still being able to handle large spikes in traffic. 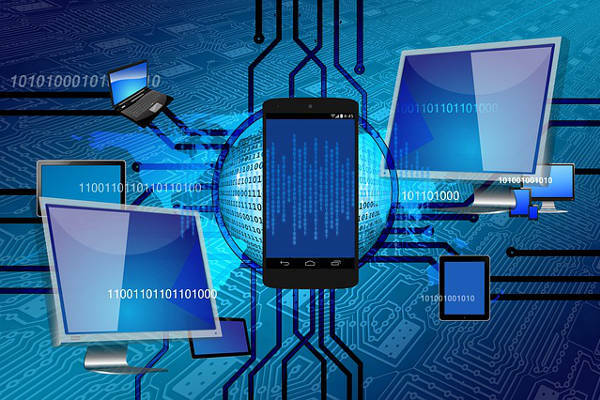 The hardware included in your dedicated plan will determine your server performance. Below we will cover CPU/Processors, RAM and Hard drives which make up the most critical performance parts of your server hardware. CPU/Processors – There are several things to think about before choosing the processor and the amount of cores you need. Firstly we think it is important to know if the application you will be using your dedicated server for is processor dependent. The next step would be to take a look at your software licensing model, is their model “per cpu”, “per server” or “per core”. Once you’ve answered these questions you can take a look at more general considerations such as performance of a core which can be found by looking at the clock speed (MHz). Generally we do advise that before the final decision is taken on which processor and the amount of cores, to consult the software vendor or the person who will be managing the application. RAM – CPU and number of cores largely determine the RAM range available to you. The higher the speed of your CPU and the higher number of cores will determine how much RAM you can use. The RAM amount is easily scalable up or down nowadays. Hard drives – Our first recommendation is the use of Redundant Array of Independent Disks or better known as RAID. RAID uses several hard disk drives for the storage and access of data. The premise is that if one drive fails, then these files are available on other drives and will automatically be rerouted to a the correct working one. There are three drives currently in use, SATA, SAS and SSD. SATA drives provide a low performance, but high volume where SAS has double the performance, with a higher price, but lower capacity. SAS has largely replaced by SSD which can be up to 100 times faster than SATA. Although you will have root access to your server and can manage your security, hosting providers do offer security support. Most hosting companies offer Anti-virus and anti-spam software on an advanced level; this is helpful in that it protects against hacks, leaks or data corruption. Hosting companies are usually quite up to date with protections against the latest versions of viruses. Having access to the remote management module is a must. The fact that you are renting a dedicated server, probably speaks to your technical capabilities and you will probably have the skills to maintain the server yourself. However, if your hosting provider does not give you access to the remote management module, you’ll essentially be locked out. This access can also be an advantage for IT. When in a transitional phase, remote management module access can serve as the step in-between which maintains existing work structures and eases the transitional phase for your IT personnel. We would like to bring this buyers guide to a close by covering the impact of site downtime. If scaling to multiple servers or the option of cloud servers is not available, you will need to decide if the business loss due to downtime is acceptable or not. Even though you will not be sharing resources with others on a dedicated plan, a server will always have a single point of failure. Because of this, you need to decide if downtime does occur, what will be the cost, and is this cost acceptable or not.